Rediscover Hope County, Montana next week when Far Cry: New Dawn launches on February 14th. Learn more about the Highwaymen and their leaders "The Twins" in this brand new live-action trailer while you wait for the release. Mickey and Lou are set to cause plenty of mayhem in their wake, can anyone stop them? You'll have to build a resistance and fight against them in a world changed by the nuclear catastrophe that took place 17 years prior. Recruit an eclectic cast of Guns and Fangs for Hire and form alliances to fight by your side against the Highwaymen's unruly leaders The Twins. Recruit Specialists to upgrade your homebase, who will help unlock all new features including crafting weapons, gear and more. 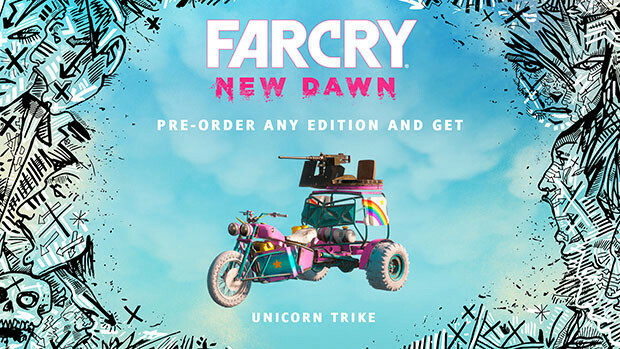 Far Cry: New Dawn launches next week on February 14th. Pre-order the game today to save and get bonuses! Is it really going to be this badass? i cnt wait to dig into it. Amazing work. Hopefully it will, we'll find out soon!